Fr. 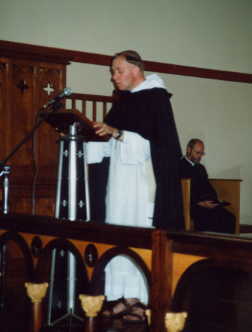 Marie-Dominique preaching at the Rosary Mission in the typical Dominican habit and cape in the church of Our Lady of Sorrows. The Dominicans also gave us a chance to come into contact with another religious order in Tradition, with their own special spirituality. Besides the monks in Avrille, France, there is a cloistered community of contemplative Dominican nuns nearby. Either are open to vocations from South Africa, although a knowledge of French would be most useful. 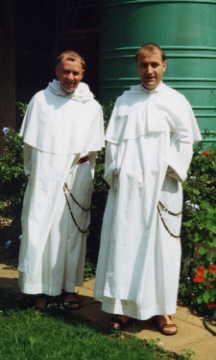 However provisions can be made for postulants to be bordered in France to first learn the language. Without any respite from the labours the 2 Fathers also gave a 5 day men’s retreat, using the Carmelite retreat centre in Benoni. All in all a great outpouring of graces in RSA.